The Santa Barbara/Puerto Vallarta Sister City Committee program is a direct cultural and social exchange between Santa Barbara, California, USA, and Puerto Vallarta, Jalisco, Mexico. Our committee was established in 1972 through the efforts of local city officials and interested citizens. The founders were Richard Hidalgo City Councilmember, Barry Cappello City Attorney, Frank Arguelles, Howard Goldman, Antonio Molina and Gregorio Romallo. The Sister City Program is a living legacy left by the late President Dwight D. Eisenhower. He conceived the program and initiated it in 1956. The Program is a dedication of friendship and understanding between peoples of different cultures and attitudes and, to those of us engaged in the program, it is discovery, it is adventure, it is a new dimension of self-awareness, and awareness of others...and it is FUN! The Santa Barbara Group is a member of the U.S./Mexico Sister Cities Association and Sister Cities International. Puerto Vallarta was chosen because of comparable features and population, commerce, tourism, etc. But the main grass-roots strength of the Sister City movement rests on the people-to-people programs, and the direct contact activity of the individual Sister Cities. These range through cultural (art and music), athletic, student, professional, industrial and commercial exchanges of every form all arranged directly by those engaged in the individual programs. A yearly highlight of the committee is the winter sojourn to Puerto Vallarta. A significant number of members usually make the ten-day visit. We get a chance to see firsthand what our efforts are producing. Our members become enchanted with this beautiful city and its friendly people. Many lasting friendships are made across the border due to these visitations. In return, our friends from Puerto Vallarta come to Santa Barbara during our annual celebration of Old Spanish Days in August and we look forward to the opportunity to returning the hospitality and show them our lovely city, share our homes, and camaraderie. At present, the Santa Barbara/Puerto Vallarta Sister City Committee has the largest membership of all the Santa Barbara Sister Cities. Our sister city organization consists of a diverse variety of individuals. We conduct monthly general meetings in the form of dinners with the focus usually on a specific program. The purpose of these meetings is to perpetuate the group by keeping all informed on current programs, and to maintain a high level of interest. We have a board of directors who meet monthly to plan programs and share in decision making. Through our board of directors, committees are formed to carry out the various programs. The sister city program is a dedication of friendship and understanding between people of different cultures and attitudes to those who engage in the program. It creates an awareness of our "south-of-the-border" neighbor, and the opportunity to enrich our lives, as well as those of our sister city. If you want to help and/or become a member of our group, please feel free to contact one of our board members and get involved with us. • We are proud to have duplicated our Dolphin Friendship Fountain in our sister city, symbolizing the lasting sisterhood and friendship our two sister cities share. • We host the El Fandango Dinner Dance, an annual Pre-Fiesta event. • In March of 1988, six Puerto Vallarta handicapped children were brought to Santa Barbara to participate in the Special Olympics. • A decompression chamber and support equipment has completely been reconstructed and delivered to the citizens of Puerto Vallarta, a project valued at $450,000. • In 1993, we contributed $10,000 toward the purchase of playground equipment for McKenzie Park to coincide with the establishment of a memorial in memory of Dr. Michael Lemus for the many contributions he made to the Santa Barbara community. The memorial is a lovely shaded arbor with a painted mural of Michael's reflections which are love, brotherhood, respect, and friendship. He believed these were essential for achieving world peace among the human race. • In 1986, we became involved in assisting the Puerto Vallarta Rotary Club in rehabilitation of crippled and disabled Mexican children. We eventually helped with the construction of a new clinic. San Luis Obispo University architectural students helped with the design, the Shriners Children's Hospital assisted with equipment along with a grant from Rotary International. Today the clinic is still helping rehabilitate children and adults and is named Pto. Vallarta-Sta. Barbara Rehabilitation Clinic. • We have contributed to making the Cruz Roja of Puerto Vallarta, a medical clinic for the underprivileged, one of the best in Mexico. • In January, 1995, we hosted the 32nd annual meeting and conference of the U.S./Mexico Sister Cities Association, and in 2001, we hosted the U.S./Mexico Sister Cities International Conference. • As part of our cultural exchange program, the Xiutla Dancers from Puerto Vallarta visited us during Fiesta time in 2002. The following year, 2003, Santa Barbara dancers, comprised of the then current Jr. and Sr. Spirit of Fiesta and several past Spirits, danced in Puerto Vallarta. • In 2003, once more as part of our cultural exchange, Javier Nino, a well known artist from Puerto Vallarta, came to Santa Barbara and painted a mural with the help of school children at the Isla Vista School. In that same year, we sponsored an artist, Alvaro Guzman, from Santa Barbara to paint a mural at a high school in Puerto Vallarta, once more, assisted by the students. • In 2002, the first ever law enforcement exchange took place. Three officers from the Puerto Vallarta Police Department visited Santa Barbara and trained with the Santa Barbara Sheriff's Department. In November of that same year, three Sheriff officers went to Vallarta to observe and train their officers. • Every year during our trip to Puerto Vallarta we chose an impoverished "kinder" or school and donate much needed supplies. "To come and to go. Not staying, yet never quite leaving, like the endless ocean waves that won't abandon the beach. 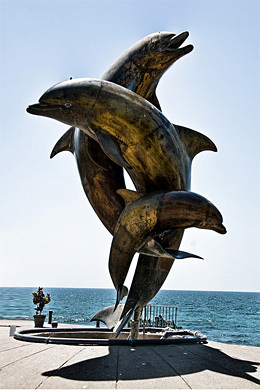 Puerto Vallarta is not Santa Barbara, yet they are remarkably similar." The Santa Barbara/Puerto Vallarta Sister City Committee has been conducting art exchanges for more than 30 years. To quote Sister Cities International: "It is often said that it is in cultural activities that a nation's ideas of itself are best represented." Sister Cities participated in a special art exchange with well known Santa Barbara artist Rafael Perea de la Cabada. He created the lithographics at the Centro Cultural Cuale in Puerto Vallarta. The two lithographs are encased in a professional portfolio which reflects a week of intense work in the Municipal Workshop of Graphic Arts la Raya. These etchings show much more than the friendship between people - they also demonstrate the affection between artistic currents in the two sister cities of Santa Barbara and Puerto Vallarta. Only 50 portfolios were created. We have 10 FOR SALE. Each portfolio contains two lithographs and has a value of $1,000. Please contact Marti Correa de Garcia at (805) 680-2163 or Craig Nielsen at (805) 967-3146 if you are interested in being the proud owner of these art pieces. Mexican-born Rafael, a contemporary painter, has been a mentor for many young artists in our community. These types of projects create great sharing experiences for the artist and showcase their creative abilities. Art is a powerful expression of visual citizen diplomacy. Thank you for your support in these very important projects! You are welcome to watch the creations come to life on November 10, 11 and 12 until 6:00 pm. The closure and Awards Ceremony will be held at 7:00 pm on November 12 outside City Hall. Santa Barbara and Puerto Vallarta have enjoyed an active Sister City relationship for more than 40 years and have twice been awarded national recognition as best overall sister city program. This program prepares us to apply for the community of Volcanes Sewing Business Building 3x1 Project in Puerto Vallarta for low income mothers so that they can acquire employment skills, earn wages and help their children to remain in school. The 2015 'X Madonnari' Chalk Art Festival will be held from November 20-22, according to the announcement made by the Puerto Vallarta/Santa Barbara Sister Cities Committee, organizer of this prestigious event. The medical equipment donated by the Goleta Valley Hospital and the fire fighting equipment donated by the Santa Barbara Fire Department are now on their way to Puerto Vallarta. With the new president, Santa Barbara/Puerto Vallarta Sister City Committee is planning more cultural, social, and political collaborations in the coming year. The ninth Festival I Madonnari in Puerto Vallarta will take place on November 7, 8 and 9, 2014 in the main square. This event is organized by the Committee of Sister Cities Puerto Vallarta - Santa Barbara. The Vallarta Botanical Gardens and Santa Barbara Botanic Gardens celebrate this relationship as “Sister Cities Gardens” through cross-promotion of their organizations and reciprocal entry offerings to their members. We're happy to announce that the Vallarta Botanical Gardens and the Santa Barbara Botanic Garden have set up a reciprocal visitation program as the first step in what we hope will blossom into a long friendship. The Santa Barbara/Puerto Vallarta Sister City Committee once again has the opportunity to build ties of friendship with citizens from Puerto Vallarta as a delegation of approximately 35 people arrived in Santa Barbara on July 19 for a week's visit.